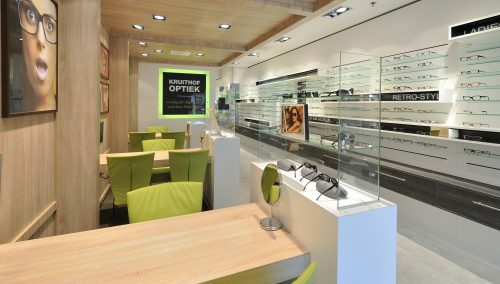 The Veenendaal shop of Konings Optiek is contemporary but not cold. The suspended lighting fixtures above the sales spaces, the colours applied, the floors, the shop display presentations highlight this. Leen Konings opened his shop Konings Optiek in 1980. This was just after the official opening of the second section of the De Passage shopping centre in Veenendaal. Some years later, Leen Konings relocated his shop to the larger current location at De Passage 57. 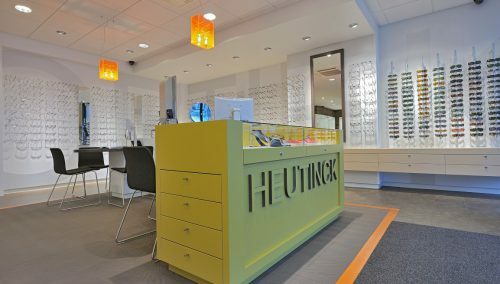 The Veenendaal optician continued to grow. In 1997, it expanded. Part of the adjacent building was annexed. The team grew to 4 persons. In 2001, Camille Mentink became a co-owner after having been employed with Leen Konings since 1995. For continuity and reliability towards the customers, they deliberately chose to continue the business just like before. In 2002, the business was renovated again, and expanded by annexing all of the adjacent building. The growth realised since involved increasing the Konings Optiek team to 9 persons.